To sustain the gains of the postgraduate program re-entry project (ReP) Learning While Having Fun: The Interactive Philippine Geography Map (InPhilGeoMap), a memorandum of agreement (MOA) was signed for the donation of the InPhilGeoMap system to the Department of Education (DepEd) Schools Division Office (SDO)-Malabon City. The MOA between NAMRIA and DepEd SDO-Malabon City was signed on two occasions: on 27 September 2018 by NAMRIA Administrator, Usec. Peter N. Tiangco, CESO I, and on 28 September 2018 by DepEd SDO-Malabon City Schools Division Superintendent (SDS), Dr. Helen Grace V. Go, CESO V. NAMRIA’s Chief-of-Staff, Ms. Rowena E. Bongalos, witnessed Administrator Tiangco’s signing of the MOA; while witnesses for Dr. Go were DepEd SDO-Malabon City’s Education Program Supervisor for Araling Panlipunan (AP), Mr. Ernest Joseph C. Cabrera, along with faculty and students of Ninoy Aquino Elementary School (NAES). This writer was also present in the two occasions. 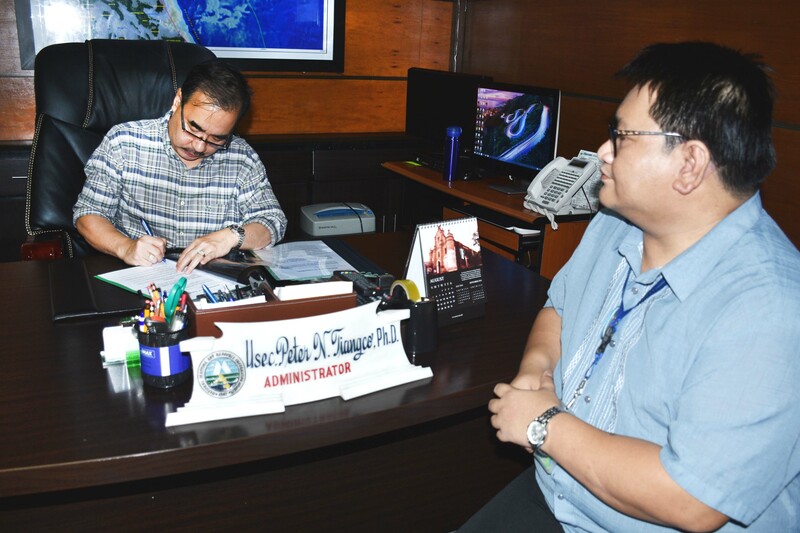 NAMRIA Administrator Tiangco signs the MOA. In the MOA is stipulated NAMRIA’s donation of the InPhilGeoMap system to DepEd SDO-Malabon City, including the training of its teachers on the use of the system. Meanwhile, DepEd SDO-Malabon City agreed to use the system as one of the instructional materials for the teaching of AP subject, including the monitoring of its use in classroom instructions. In addition, DepEd SDO-Malabon City will provide the venues and other necessary materials for future trainings in relation to the system. NAES pose for a souvenir picture at the MOA signing. The InPhilGeoMap system was one of the deliverables of the ReP of this writer in his bid to earn a master’s degree in development management at the Development Academy of the Philippines. The system serves as a tool for learning basic Philippine geography and contains the basic profile of the 81 provinces of the country such as: capital, population, foundation date, languages/dialects, festivals, and major industries. It also contains some essential geographic information about local government units such as land area, water bodies, land cover, and locations of public elementary and high schools. Natural hazard information such as earthquake-induced landslide, ground shaking, liquefaction, tsunami, and active faults for Greater Metro Manila Area were also included in the system. Initially, the information in the system were taken from the Philippine Geoportal (www.geoportal.gov.ph), the official DepEd textbook for Grade IV students, the Philippine Information Agency (www.pia.gov.ph), and local government units.